According to the Ningbo General Administration of Customs, Sanya and Haikou Duty-free Stores saw over RMB1.5 billion sales volume from April 2011 to the end of February 2012. Since Hainan launched its duty-free shopping policy on 20th April last year, Hainan duty-free stores sold 2.36 million duty-free goods with over RMB1.5 billion sales volume, which is roughly equivalent to the annual turnover in a large-scale shopping mall in Beijing. The figures show that the sales volume in Hainan duty-free stores has surpassed that in Okinawa and Jeju. Last year, Hainan port recorded US$120 million of duty-free goods, up 16 times year on year. Hainan has become the No. 4 area carried out offshore duty-free policy, besides Okinawa in Japan, Jeju in Korea, Chinmen and Matsu in Taiwan. The opening of the duty-free store in Haikou Meilan International Airport marks the comprehensive pilot of off-shore duty-free policy in Hainan. 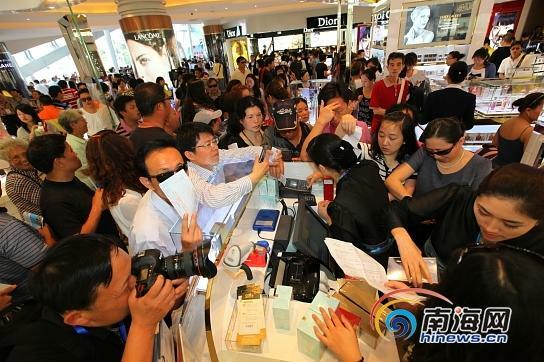 In addition, off-shore tourists call for enhancing the limit of RMB5000 for duty-free shopping for each person each time, which is far from enough to meet consumers’ demands.